Iran’s image remains negative throughout much of the world, and has eroded significantly over the past year in several countries, including Turkey, Egypt and Indonesia. Iranian President Mahmoud Ahmadinejad continues to inspire little confidence internationally. However, the poll finds Shia Muslims in Lebanon holding overwhelmingly positive opinions of the Iranian president, reflecting a broad divide in how Sunni and Shia Muslims view Iran and its controversial leader. Most of the Muslim countries surveyed have negative or mixed opinions of Iran. Majorities among just three Muslim publics – in Pakistan, Bangladesh and the Palestinian territories – say they favor Iran acquiring nuclear weapons. And the prospect of a nuclear-armed Iran engenders concern in the Middle East and elsewhere. Views of Iran are uniformly negative among major industrialized nations. Publics in Germany and France register the most negative opinions – more than eight-in-ten in these countries (85% and 84% respectively) view Iran unfavorably. Roughly seven-in-ten in the U.S. (71%) and two-thirds in Canada (67%) have an unfavorable view of Iran, along with comparable majorities in Italy, Spain, Sweden and Japan. Only in Israel is the balance of opinion toward Iran even more negative (93% unfavorable, 5% favorable). In Eastern Europe, views of Iran are slightly less unfavorable than in Western Europe, but substantial majorities in the Czech Republic, Slovakia, Poland, and Bulgaria express negative opinions. Views of Iran are divided in Ukraine and Russia, with nearly four-in-ten in both countries expressing favorable opinions of Iran (37% Russia, 38% Ukraine). Positive views of Iran have declined sharply over the past year in three Muslim countries – Indonesia, Egypt, and, especially, Turkey. In 2006, the balance of opinion in Turkey was positive toward Iran (53% favorable/ 35% unfavorable). In the current survey, negative opinions of Iran outnumber positive ones by roughly two-to-one (56% to 28%). The change has been less dramatic in Indonesia and Egypt, though in both countries favorable opinions of Iran have declined significantly (13 points in Indonesia, 11 points in Egypt). Iran’s image, already poor in advanced industrial democracies, has declined in the U.S., Great Britain, Japan, Spain and France. In Great Britain, the only Western European country surveyed in 2006 where Iran was not viewed negatively by a majority, nearly six-in-ten (57%) now hold an unfavorable view of that country; just 24% of the British have a positive impression of Iran. Ratings of Iran’s president are considerably more negative than are views of his country. Solid majorities in the United States, Canada, and in every European country surveyed except for Russia and Ukraine, say they have little confidence, or no confidence at all, in Ahmadinejad to do the right thing regarding world affairs. In fact, most respondents in the United States, Canada, France, Germany, Italy, Spain, Sweden, the Czech Republic, Poland, and Bulgaria say they have no confidence at all in the Iranian leader. The balance of opinion on Ahmadinejad’s leadership is also negative – though less so – in Russia and Ukraine. In Russia, 18% say they have at least some confidence in the Iranian president, while 44% express little or no confidence. In Ukraine, negative opinions of Ahmadinejad’s leadership outnumber positive ones by 39%-13%, though nearly half (48%) do not offer an opinion. Of the 47 publics surveyed, Israelis express the most negative views of Iran and its leader. More than nine-in-ten Israelis (93%) hold an unfavorable opinion of Iran, with 77% saying they have a very unfavorable opinion. When asked about Ahmadinejad, fully 80% of Israelis say they have no confidence at all in the Iranian leader’s ability to handle world affairs. While Iran and its president are widely unpopular in much of the world, the picture is more mixed among Muslim publics in Asia, Africa, and the Middle East. Ratings of Iran are more negative among Muslims in the Middle East than in Asia, while results among African Muslims are more mixed. In the Middle East, only the Palestinians register a positive view of Iran. A clear majority in the Palestinian territories (55%) say they have a favorable opinion of that country. By contrast, majorities in Jordan, Lebanon, and Turkey hold negative opinions about Iran; Egyptians are split, with 48% saying their opinion of Iran is favorable and half expressing an unfavorable view. Solid majorities of Muslims in Ethiopia and Nigeria express positive opinions about Iran, but in the two predominantly Muslim countries surveyed in Africa – Mali and Senegal – views of Iran are more divided. Half of Muslims in Mali expresses a positive view of Iran, while just over four-in-ten (41%) have a negative opinion. In Senegal, Muslims are split – 43% have a favorable view and 41% have an unfavorable view of Iran. Muslims in Asia express a much more positive view of Iran. Iran receives its most positive rating in Bangladesh, where eight-in-ten say they have a favorable opinion. Solid majorities in Pakistan, Indonesia, and Malaysia also view Iran favorably, but this figure is down in Pakistan and Indonesia, where comparative data from 2006 are available. Last year, 73% of Muslims in Pakistan and 81% in Indonesia held a positive view of Iran. Today, the percentages of Pakistani and Indonesian Muslims who express this sentiment are 69% and 66%, respectively. Iran’s popularity is also down in the three Middle Eastern countries where a trend is available. Last year, 53% of Muslims in Turkey had a positive opinion of Iran and 35% had a negative view. Today, just 28% say they have a favorable opinion of the neighboring country compared with 56% who say they hold an unfavorable opinion. In Egypt, Iran’s favorability has dropped 13 points, from 62% to 49%, and a more modest drop is seen in Jordan. Ahmadinejad is also generally less popular among Muslims in the Middle East than in Asia. Nearly eight-in-ten (78%) Jordanian Muslims say they have little or no confidence in the Iranian leader, who does not receive particularly positive ratings in any predominantly Muslim country in the region. In Egypt, 72% say they lack confidence in Ahmandinejad to do what is right regarding world affairs. And in Turkey, where less than half (49%) had a negative opinion of the Iranian president in 2006, Ahmadinejad now receives low ratings from 55% of the public. Despite drops in Iran’s popularity in Pakistan and Indonesia since 2006, Ahmadinejad is more popular with Muslims in those countries than he was a year ago. In Pakistan, 42% have at least some confidence in Iran’s president to do the right thing regarding world affairs, compared with 32% in 2006; in Indonesia, confidence in Ahmadinejad had edged up slightly from 51% to 53%. Sunni Muslims in Lebanon are nearly unanimous in their negative views of Iran. More than nine-in-ten (92%) express an unfavorable opinion. By contrast, only 13% of Shia share this view, while 86% say they have a favorable opinion of Iran. Lebanese Sunnis and Shia also differ in their opinions of Ahmadinejad. Among Shia in Lebanon, three-quarters say they have confidence in Iran’s president to do what is right regarding world affairs. Among Sunnis, however, only 5% have confidence in Ahmadinejad, compared with 94% who have little or no confidence in the Iranian leader. Divisions between Sunnis and Shia also are evident in Kuwait. About half of Kuwaiti Shia (51%) express a favorable view of Iran, compared with roughly a third of Sunnis (34%). Regarding Ahmadinejad, 51% of Shia say they have confidence while 29% have little or no confidence in the Iranian president. Sunnis, however, are about three times more likely to express negative views of Ahmadinejad than they are to say they have confidence in him (20% have at least some confidence and 61% have little or no confidence). Differences between Shia and Sunnis are not as pronounced in Mali and Nigeria. 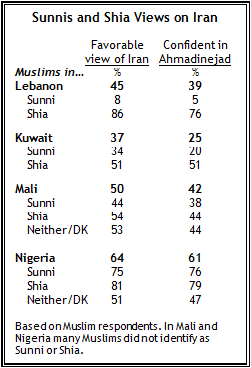 Just over half (54%) of Shia Muslims in Mali rate Iran favorably, compared with 44% of Sunnis. In Nigeria, wide majorities of both Shia (81%) and Sunni (75%) Muslims feel favorably toward Iran, while Muslims who don’t think of their religion in these terms are less favorable (51%). In Ethiopia and Nigeria, opinions about Iran are divided along religious lines. Ethiopian Christians express unfavorable views by about four-to-one (18% favorable vs. 71% unfavorable). Muslims in that country, on the other hand, are more likely to have a favorable opinion of Iran by roughly two-to-one (63% favorable vs. 32% unfavorable); a similar pattern is seen in Nigeria. And while 64% of Muslims in Ethiopia have at least some confidence in Ahmadinejad, only 6% of Christians say this is the case and 84% say they have little or no confidence in Iran’s president. Differences between Christians and Muslims are not as pronounced in Tanzania. Majorities in 32 of the 37 countries that were asked about Iran’s nuclear program oppose Iran acquiring nuclear weapons. Opposition is very strong in North America, Latin America, and Europe, as well as in Japan, South Korea, and Israel, and there is also considerable resistance to Iran’s weapons program in some predominantly Muslim countries in Asia and the Middle East. In Jordan and Egypt, where the public was divided on this question just a year ago, there is now clear opposition to Iran acquiring nuclear weapons. In 2006, 45% of Jordanians and 44% of Egyptians favored Iran’s nuclear program while 42% in each country opposed it. Today, 55% of Jordanians and 57% of Egyptians say they would be against Iran obtaining nuclear weapons. Majorities in Kuwait, Turkey, Indonesia, and Lebanon also say they would oppose it. Sunni and Shia Muslims in Lebanon and Kuwait are split on the nuclear question. Three-quarters of Lebanese Shia say they would favor Iran acquiring nuclear weapons, while nine-in-ten Sunnis would oppose it. The difference is somewhat less pronounced but still significant in Kuwait, where the Shia population is divided (44% favor and 43% oppose) and Sunnis are two and a half times more likely to oppose Iran’s nuclear program as they are to support it (26% favor and 65% oppose). In India and China, where majorities already expressed opposition to Iran acquiring nuclear weapons a year ago, even larger shares of the population now say they would not favor Iran’s weapons program. Nearly seven-in-ten in China (69%) and about two-thirds in India (66%) oppose the program, compared with 52% and 59%, respectively, in 2006. Palestinians, Pakistanis, and Bangladeshis are the only publics that favor Iran’s nuclear weapons program. Nearly six-in-ten in the Palestinian territories and Pakistan (58%) and more than half in Bangladesh (52%) say they would favor Iran acquiring nuclear weapons. Publics across the world, including those in Iran’s backyard, are concerned that a nuclear-armed Iran would represent a threat to their countries. Israelis are among the most worried; 89% say Iran would be a threat to their country if it obtained nuclear weapons. Majorities or pluralities in all North American, Latin American, and European countries also see Iran’s nuclear weapons program as a potential threat. Among the publics of predominantly Muslim countries in Asia and the Middle East, the Kuwaitis, the Lebanese, and the Turks are the most concerned about Iran’s nuclear program. About seven-in-ten in Kuwait (71%), 63% in Lebanon, and 59% in Turkey believe Iran would represent a threat to their country if it were to acquire nuclear weapons. Jordanians are divided – 48% see Iran as a potential threat and 49% do not. Only in Pakistan and the Palestinian territories do majorities say Iran’s nuclear weapons would not be much of threat. In Lebanon and Kuwait, again, Shia and Sunnis see things differently. Kuwaiti Shia are somewhat divided, with 43% saying Iran would represent at least a somewhat serious threat to their country and 49% saying it would not. Three-quarters of Sunnis in that country believe Iran is a potential threat. Shia in Lebanon strongly reject the idea that Iran might represent a threat to their country if it were to acquire nuclear weapons. By roughly four-to-one, Lebanese Shia think Iran would pose only a minor threat or no threat at all (78% minor or no threat vs. 20% very serious or somewhat serious threat). By contrast, only 18% of Lebanese Sunnis believe Iran’s nuclear weapons would not be much of a threat to their country, while 81% worry that Iran might pose a threat.